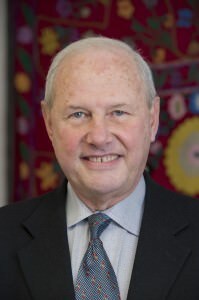 S. Frederick Starr is the founding Chairman of the Central Asia-Caucasus Institute and Silk Road Studies Program, a joint transatlantic research center affiliated with the Paul H. Nitze School of Advanced International Studies, Johns Hopkins University in Washington (where he is a Research Professor) and the Institute for Security and Development Policy in Stockholm. His research on the countries of Greater Central Asia, their history, development, internal dynamics, as well as on US policy towards the region has resulted in twenty-two books and 200 published articles. He has also written extensively on Russian History and current affairs. His most recent books are “The Ferghana Valley: The Heart of Central Asia”, and “Lost Enlightenment: Central Golden Age from the Arab Conquest to Tamerlane. An essay on this theme, “Rediscovering Central Asia” (Wilson Quarterly, Summer 2009) was included in Christopher Hitchin’s “Ten Best Essays of the Year” and won the New York Times columnist David Brooks’ “Sidney Award” for 2009. Dr. Starr is a frequent commentator on the affairs of the region, and the author of numerous articles in journals including Foreign Affairs, Foreign Policy, The National Review, Far East Economic Review, and op-eds in various leading American and international newspapers including the New York Times, Wall Street Journal, Washington Post, International Herald Tribune, Christian Science Monitor, Los Angeles Times. During the past decade he has returned repeatedly to the challenge of reopening continental-wide transport passing through Central Asia and Afghanistan, which he sees as a key to success in Afghanistan itself. This issue was the subject of a series of articles between 2000 and of a book “The New Silk Roads”, published in 2007. For writings that have had a direct impact on policy see “The Key to Success in Afghanistan” [with A. Kuchins et al] “Afghanistan Beyond the Fog of Nation Building: Giving Economic Strategy a Chance”, and with Adib Farhadi, “Finish the Job: Jump-Start Afghanistan’s Economy” published in 2011. Dr. Starr was the founding Chairman of the Kennan Institute in Washington, and served as Vice President of Tulane University and President of the Aspen Institute and of Oberlin College (1983-94). He was closely involved in planning the University of Central Asia and the Azerbaijan Diplomatic Academy and is a trustee of the Nazarbayev University in Kazakhstan. He earned his Ph.D. in History at Princeton, MA at King’s College, Cambridge, and his BA at Yale, and holds four honorary degrees. Dr. Starr is also a founding member of the Louisiana Repertory Jazz Ensemble of New Orleans and founded the Greater New Orleans Foundation, the single largest non-governmental sponsor of post-Katrina recovery in that city. He has written six books on New Orleans including “New Orleans Unmasqued”, “Southern Comfort”, “Inventing New Orleans: The Writings of Lafcadio Hearn”, “The Life and Times of Louis Moreau Gottschalk, and Une Belle Maison: The Lombard Plantation House in New Orleans’s Bywater”.